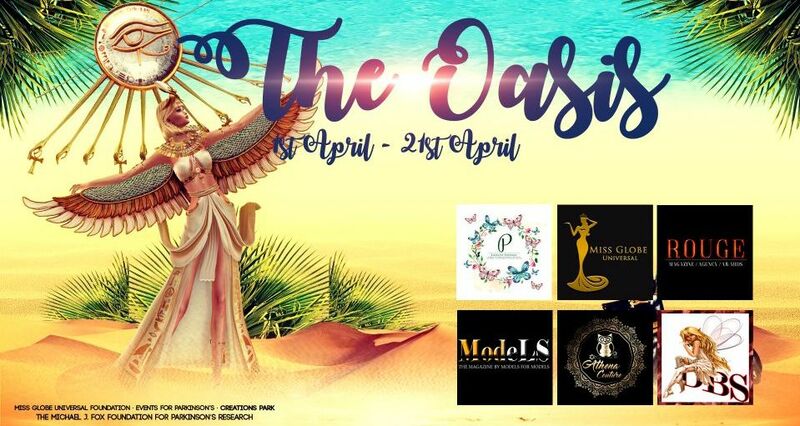 Within Second Life, Creations For Parkinson’s/Events For Parkinson’s have partnered with Miss Globe Universal Charity Foundation to also mark Parkinson’s Awareness Month, with The Oasis, which opened its doors on April 1st, 2019, and which will run through until Sunday, April 21st. Sunday, April 7th, 2019 at 10:00am SLT. Saturday, April 20th, 2019, at 10:00am SLT. There are also two fun hunts. In the first, look for miniature pyramids in the stores. Purchase them for L$15 each (all donations to the charity). In the second, visit one of the two Great Pyramids. The camel guide you through the dark entrance into the stunning treasure house of the ancient Pharaohs. Find hidden treasures among the gems. Don’t be fooled though, some of the jewels are a trap. In addition, the second Great Pyramid contains a mysterious maze – can you find the hidden entrance and make your way around the interior and discover artefacts and locate magnificent Golden room at the heart of the tomb? Parkinson’s Disease Awareness Month is intended to raise public awareness of the disease, its impact, and to encourage people to help support those affected by Parkinson’s by encouraging them to donate to organisations carrying out research into finding a cure or adequate treatment for the disease. As noted above, these organisations include the likes of the Parkinson Society Canada, the American Parkinson Disease Association, and Parkinson’s UK. Red, White and Blue is the name of a week-long event being held by Creations for Parkinson’s in support of the Michael J. Fox Foundation. It opens its doors on Friday, May 27th, 2016, and will run through until Monday, June 6th, 2016, and features live performers, DJs, tribute concerts, shopping gachas, a hunt, a carnival and a special art auction. The event takes place on a specially constructed sky platform over Creations Park, to help reduce lag issues, and is sponsored by Windlight Magazine, Azul and Chop Zuey Fine Couture Jewellery. The merchants participating in the event are: Alme, Azul, Entice, KL Couture, Like Design, Meshopotamia, Miss Darcy, Paris Fashion, %Percent Furniture and Lighting, Soyralle, Tashi, TRS Designs, Whimsical Happenings, and Windlight Workz. The art is displayed on the terraces either side of the main performance area, and features pieces by Barret Darkfold, Carleey Noonan, Cherrycarr Resident, Eleseren Brianna, jamie86 Resident, Johannes1977 Resident, JolieElle Parfort, KodyMeyers Resident, Muse4u Resident, Myra Wildmist, Otoc Resident, Rage Darkstone, Rinzlerkitty Resident, Sheba Blitz, Syphera Inaka and Theda Tammas. All are available for auction via the Creations kiosks alongside each piece. The carnival includes a host of rides to enjoy, including a roller-coaster, bumper cars, pirate ship swings, a gravitron ride, a Ferris wheel and many assorted side-shows and games to enjoy. Funds raised through bids for the art, via the Team Fox donation kiosks, the carnival ticket machines and the gacha machines will all be donated to Team Fox, the fund-raising arm of the Michaeel J. Fox Foundation. The participating merchants also have items for sale through special Creations for Parkinson’s vendors. Creations Park was established by Barbie Alchemi after witnessing the beneficial effects Second Life had on her mother, Fran Serenade, a Parkinson’s sufferer and who first became involved in the platform, along with Barbie, as a means for family members to keep closer contact with one another across the breadth of the United States. Creations is dedicated to raising donations for the Michael J Fox Foundation for Parkinson’s Research (MJFF). As well as running a range of fund-raising events and activities, the Park offers support groups and research into the positive effects of Second Life for people with Parkinson’s Disease. 100% of all donations received through events at, and visits to, Creations Park go directly to Team Fox and the MJFF. All costs and expenses associated with the region are met directly by Barbie’s family. You can read more about the story of Creations Park in my 2013 article on Barbie and Fran, or by watching a Drax Files video. Starting at 14:00 SLT on Sunday, April 12th, 2015, Creations Park will be hosting a special benefit for Team Fox and the Michael J. Fox Foundation for Parkinson’s Research (MJFF). 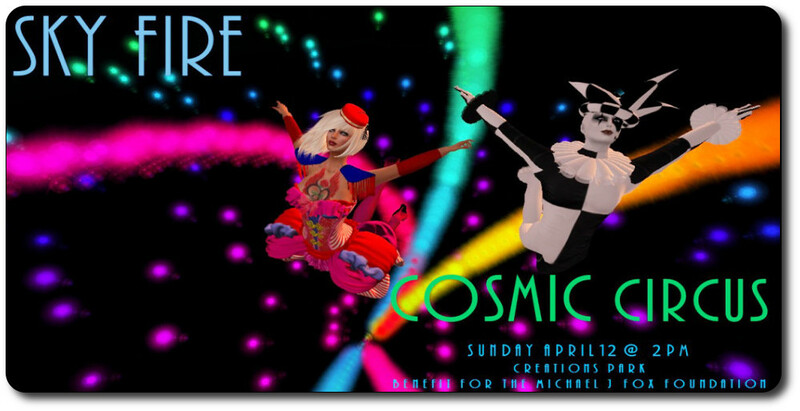 Taking place at Creation’s ethereal skyborne Creations Park Dance Club and Living Light complex, the event comprises a special presentation of particle magic by the Sky Fire team, entitled Cosmic Circus and featuring Particle Tom and Lexi Marshdevil. It will be followed by a celebration dance featuring DJ Sunshine. If you’ve never seen a particle show in Second Life, then Sky Fire make for a superb introduction, and the Living Light complex at Creations Park makes an excellent venue in which to enjoy the show. What’s more, 100% of all donation made during both the show and the dance will go directly to Team Fox, and thence to the MJFF, contributing directly to the ongoing search for a cure for Parkinson’s Disease, and to ways and means of alleviating the symptoms for those already afflicted by the disease. As particle shows are popular, the advice is to attend the venue early to be sure to gain a seat. Please lightening the load by removing excess scripted objects, etc., and set your local time to midnight to fully appreciate the show. After the show and dance, be sure to give yourself time to explore the other facilities and venues Creations Park offers, such as the Etheric Light Centre, the Peace Nation Park, Atlantis mermaid underwater cove, Winter Wonderland and more. Through all of the venues and locations, there are opportunities to make donations to Team Fox and even to gain some retail therapy as well! 18:00 – 20:00: “Embracing the Light” dance and discussion with Ananda & Redorange.